See-through Fireplaces. Marble or tile surround Fireplaces. Modern Fireplaces. Fireplaces with built-in Cabinetry. 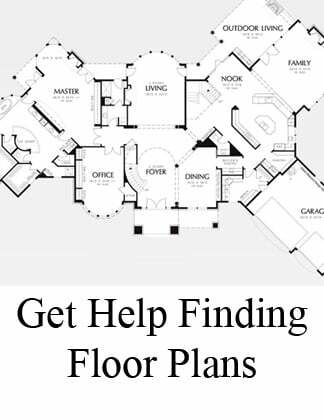 It can be a lot of fun to work with your builder to design your new fireplace for your custom home. Whether you want your fireplace to be bold and prominent or small and subtle, here are 19 great ideas for your new fireplace. 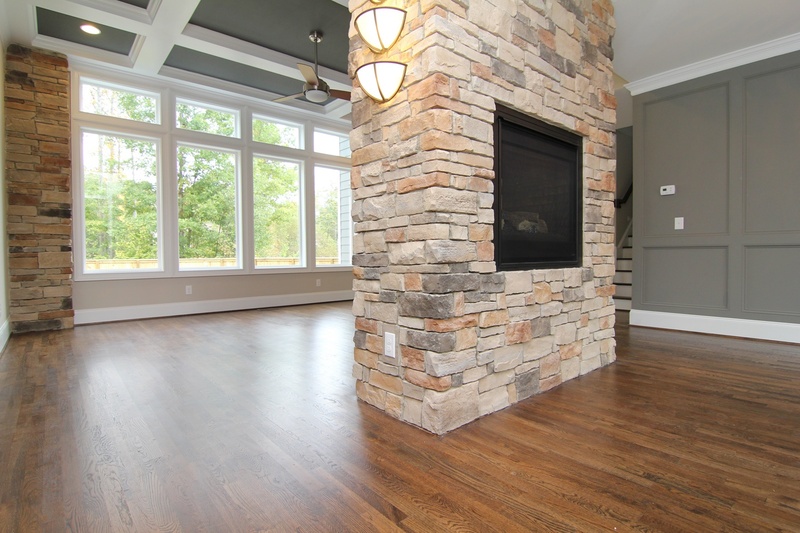 Read on to see what's trending for fireplaces in 2019, in NC. This see-through fireplace between the Formal Dining Room and Great Room provides a warm centerpiece to the gathering areas in this custom designed home by Stanton Homes. It also serves as structural support. 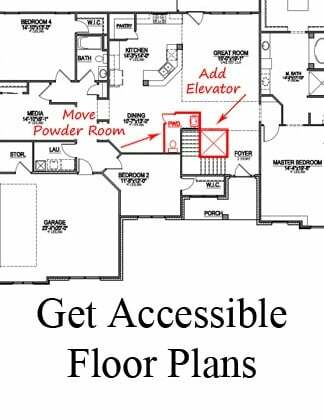 Stone colors were selected to add softness and blend with gray walls and hardwood flooring. Additional stone accents in the Great Room and Front Porch provide continuity for this design theme. This 3-sided see-through fireplace was custom designed to provide views of the fireplace from the master suite, dressing area and master bath. The wall of windows in the master suite provides additional natural light, with romantic appeal. 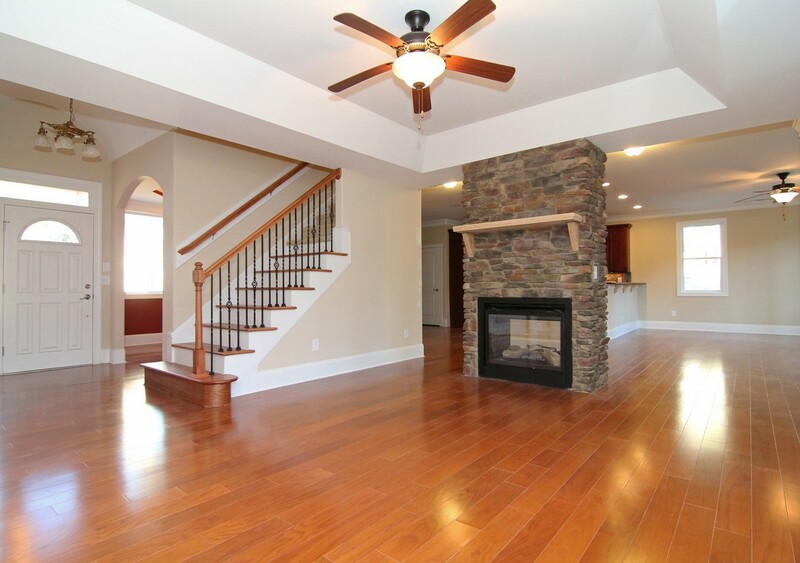 This custom home has four fireplaces. 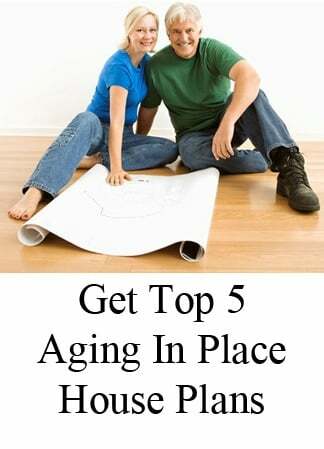 Click on the photo to see more. 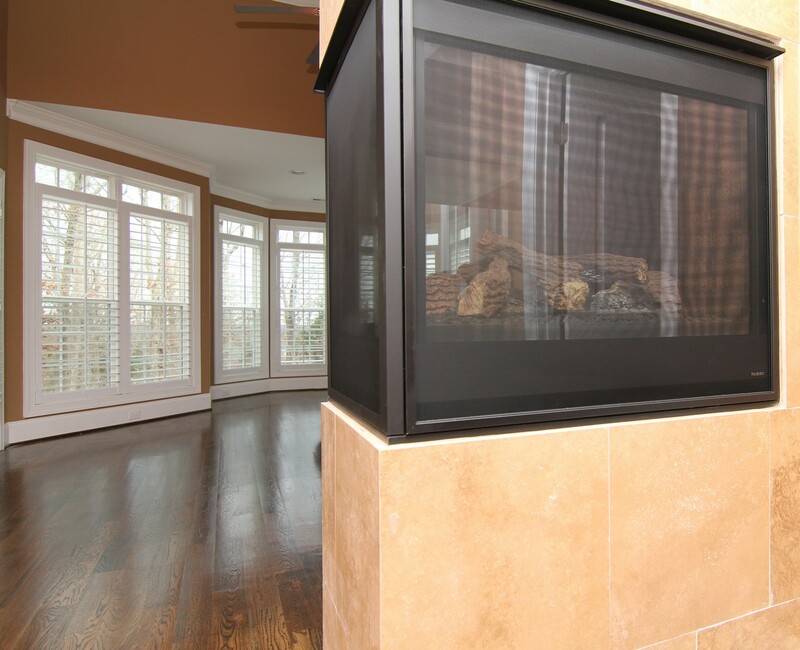 This see-through fireplace provides firelight views from the Keeping Room, Great Room and Kitchen. 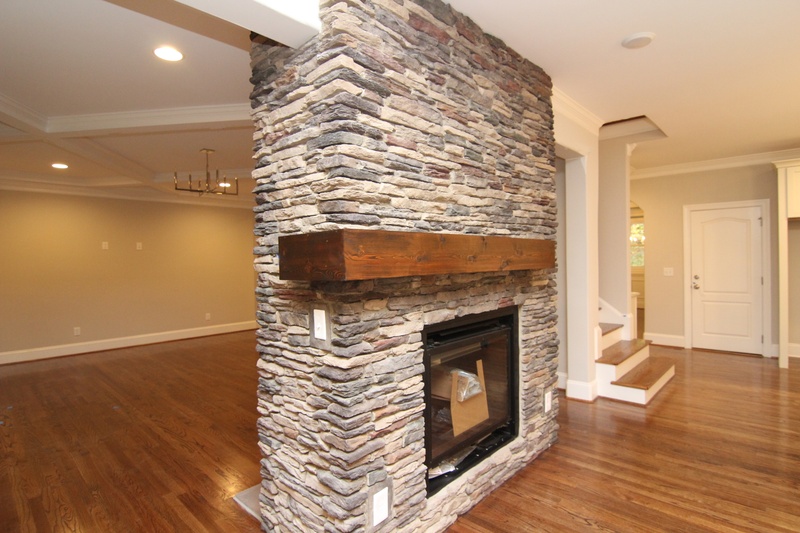 The stacked stone adds a lightness to this massive floor to ceiling fireplace structure. A custom built Craftsman mantle was site-built to create a unique accent. This see-through fireplace was strategically placed toward the side, to allow for more wide open space between the Breakfast Room and Great Room. It's open view from either side enables everyone in the main areas of the home to enjoy its warmth. 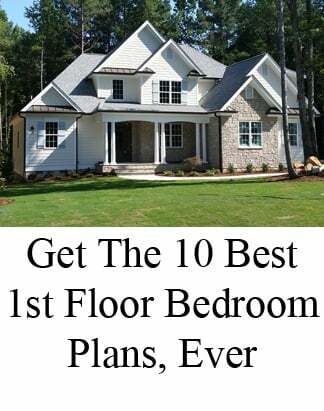 But it's positioning makes it more of a statement than a centerpiece, with the ability to create a more intimate sitting area apart from the rest of the room. This see-through fireplace emphasizes outdoor living, with a connection from the home's biggest gathering points to the screen porch. A wall of windows further emphasizes the link to additional entertainment areas outside. 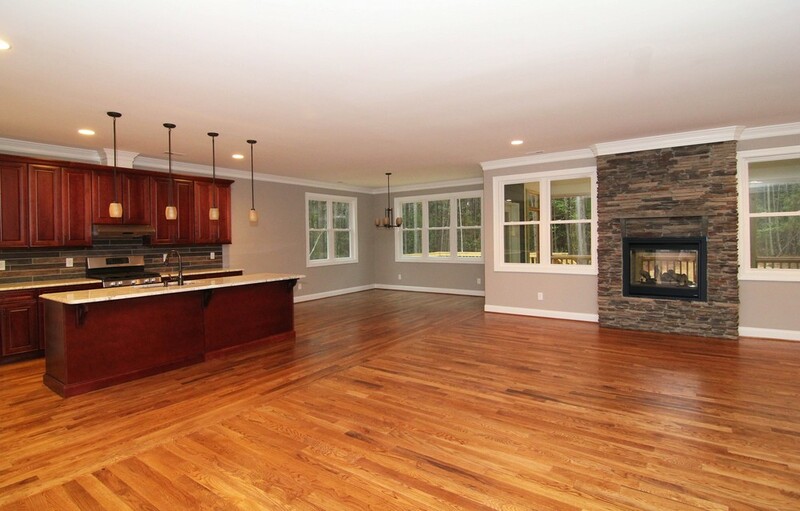 Access to the fireplace on the outside of the home extends usage of the screen porch for year-round enjoyment. This modern fireplace is replicated by the geometric design of windows that reflect the shape in an alternate pattern nearby. Designed for the simplicity of a contemporary design, its presence is strong - with the effect of a single work of art on a large wall - and yet subtle. This modern fireplace is framed in marble that draws attention to its significance. Set on the back wall of the Great Room facing the Kitchen, this fireplace is further enhanced by an abundance of natural light through glass doors and walls of windows that encase every aspect of the sunroom to its side. This custom designed modern fireplace with an artistic raised hearth setting provides a dramatic black and white contemporary touch to the entrance of this custom home. Tucked into a front corner of the Great Room, its one of the first unique aspects to be noticed upon entering the home. This modern fireplace offers warmth to this basement retreat, in tandem with a full bar, wine rack and spacious entertainment areas. Set into a stone surround, the fireplace setting reflects the color choice in a brick wall behind the bar. 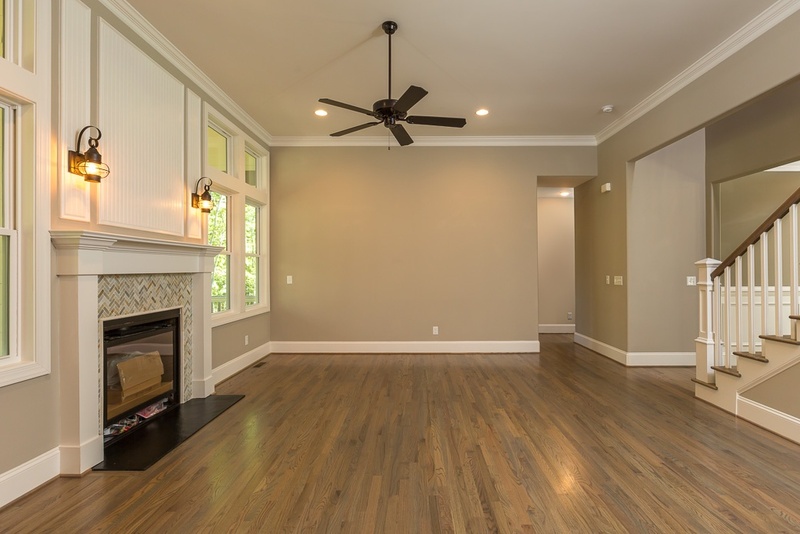 An engineered wood floor ties the room together with similar soft brown tones with a hint of gray that matches the surrounding walls. 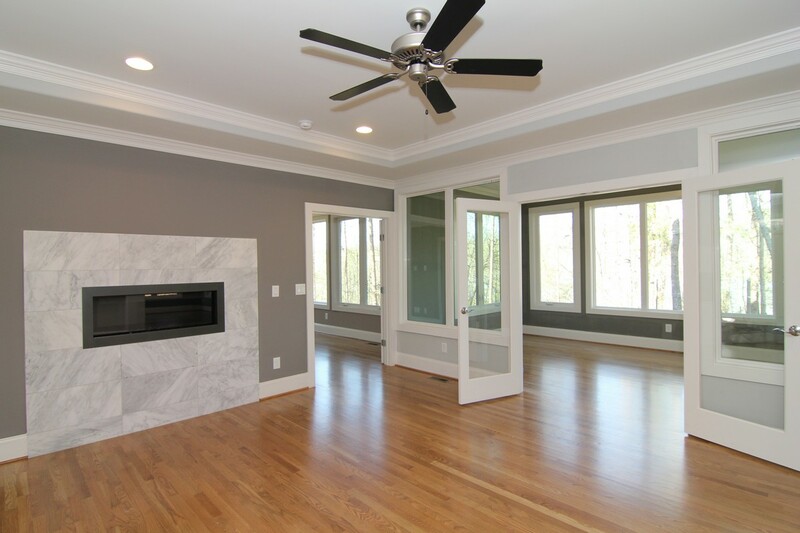 This modern/contemporary fireplace in NC is designed to be a very important part of the room, with extensive cabinetry on both sides as well as custom designed trim detail. The entire wall of windows (including transom windows) light up every detail. The stain choice for the hardwood floor and the stark white features are a nice contrast with pale blue and gray accent walls. 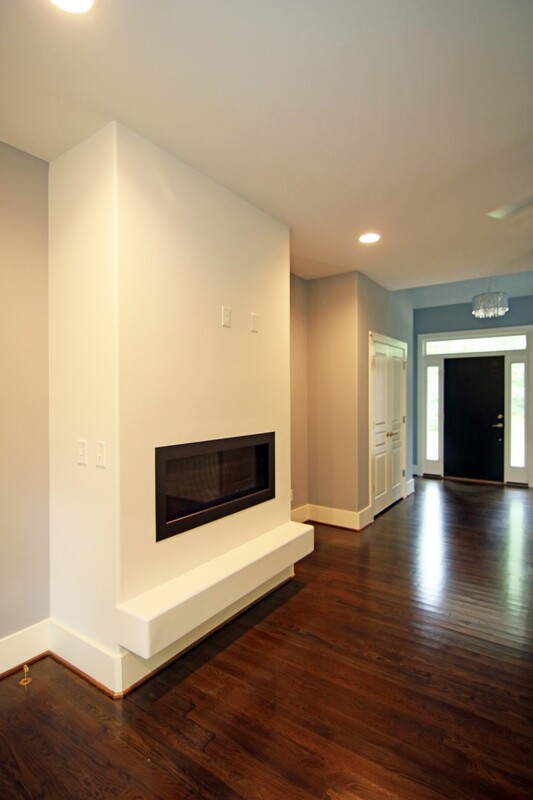 This custom designed fireplace provides a spark of simplistic color in room dominated by white accents - from a huge coffered ceiling to wall to wall shelving, and white rails and trim work on the stairway beyond. The fireplace is framed by big tiles (including a flat hearth) and topped by a site built mantle. 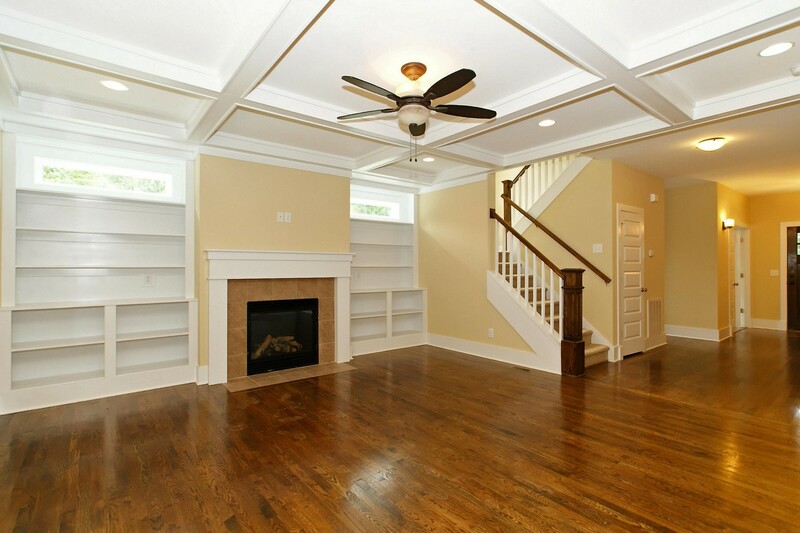 Transoms over the top of the shelving on either side of the fireplace add natural light. 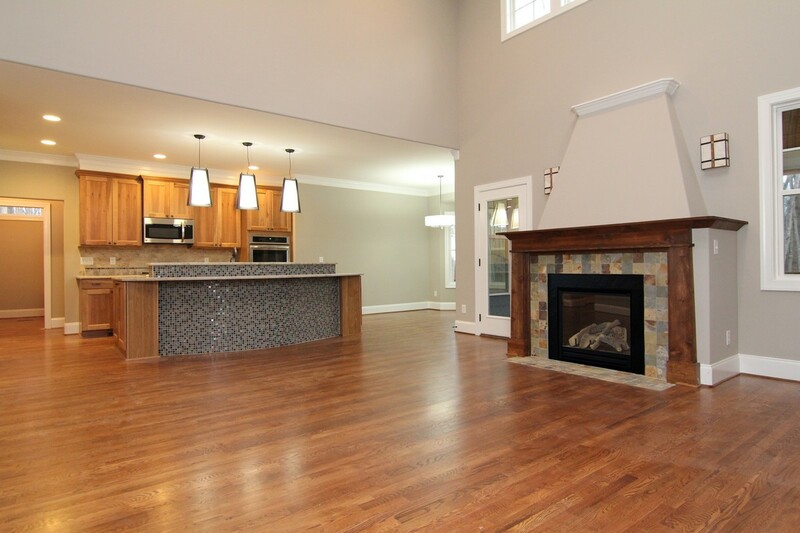 This NC new home fireplace has a surround of gray tile and white grout with a custom made mantle and shiplap backdrop. The alternating splashes of gray and white add interest. 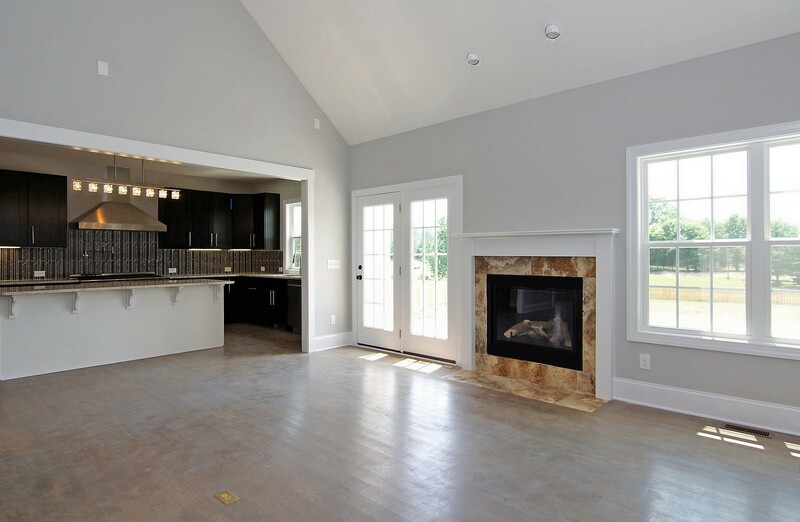 White trim around the double sliding glass door with picture windows on either side, as well as white trim at the ceiling and floor complete this modern farmhouse fireplace setting. This custom designed fireplace setting is choreographed with its surroundings. Lower cabinetry follow the wall and extend around the corner, to fully encase the entire end of the room. Upper shelves to the left replicate the look of the overhead catwalk to the right, with parallel lines as opposed to the horizontal lines of the railings. The custom fireplace choice of solid black pops from the white backdrop. 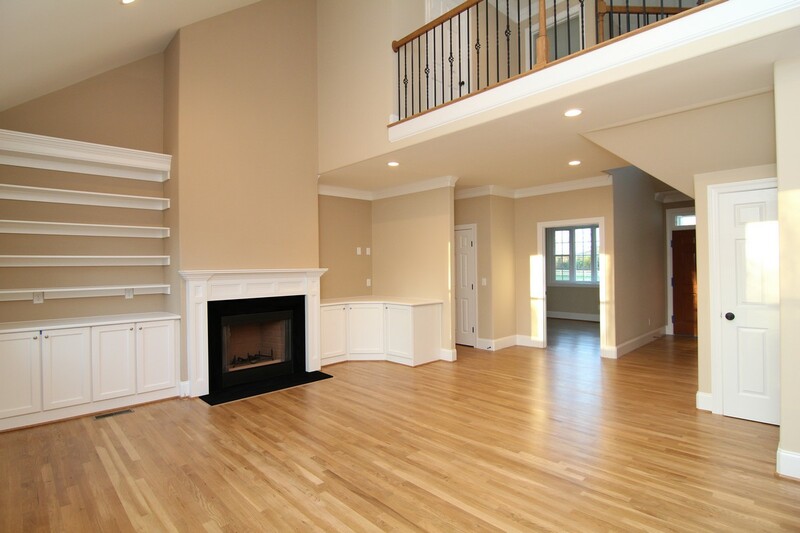 Tan walls meld beautifully with the stain choice for the hardwood flooring. This custom designed fireplace gets right to the point, with a contemporary design in grey, black and white. 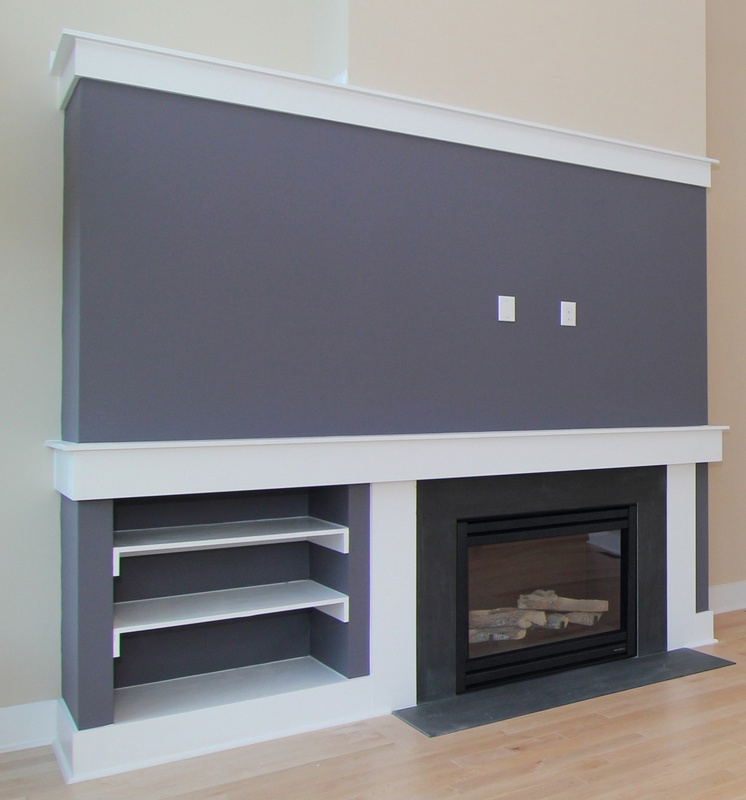 Basic shelving, Craftsman trim, and straightforward simplicity make this fireplace stand out. Slate surround and a flat slate hearth retain the purity of design, with a no-nonsense approach to a design/build custom fireplace. This custom designed fireplace is traced in tradition, with cabinetry and shelving placement that has remained popular for generations. The site built custom mantle adds an interesting twist, with clever trim pieces that were hand drawn and selected. The totally unique fireplace and island in this picture were hand crafted by Stanton Homes based on European influence and the custom requests of the homebuyer who worked directly with the design/build team to create this home. 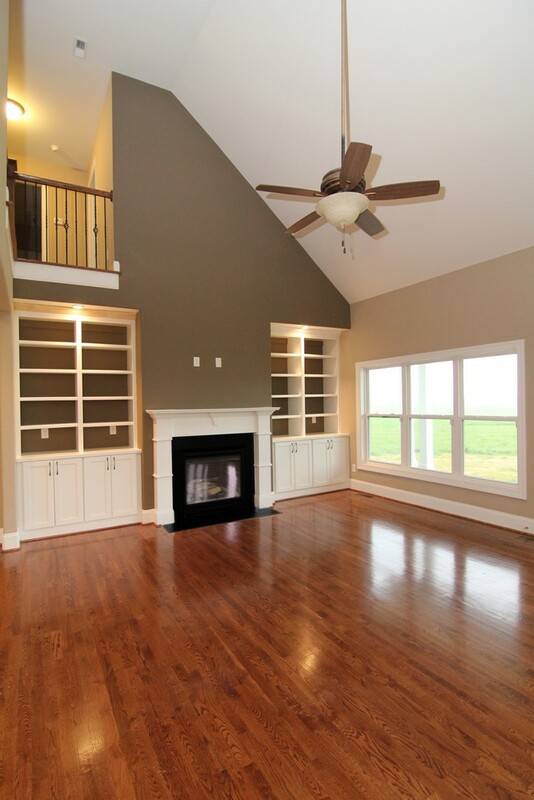 You won't find anything like this in a production or semi-custom home. 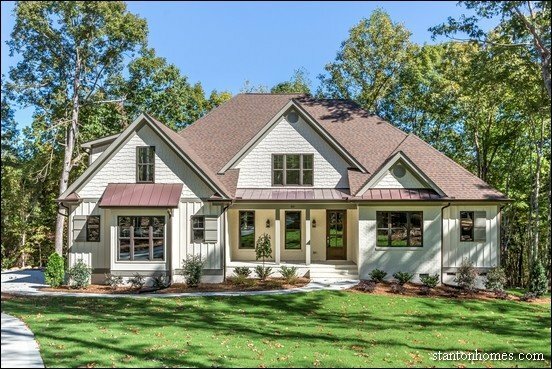 It's a perfect example of how creative you can be when you build a truly custom home. Next to a chef's kitchen that pulled out all the stops, this classic fireplace overlooks the Great Room. With a soaring ceiling above, the subtle simplicity of a traditional fireplace set in a stone surround with a barely-there basic mantle and crisp white trim is the perfect anecdote to this upscale custom home. Set in a place of importance on the longest wall in the Great room, with a wall of windows on either side and coach lights to draw attention, this custom built fireplace adds a playfulness to the gathering area through a tile mosaic surround. The site built mantle adds a bold shelf above and columns on either side further capitalize on the French Country design of this custom home. This fireplace has contemporary/modern appeal, with custom designed hand built columns, mantle, and sculpted artistry to the ceiling. The crisp linen effect is accented by a marble surround. This is just one of the four fireplaces in this custom home in NC - each fireplace has an entirely different look and purpose. Click the photo to see the others.